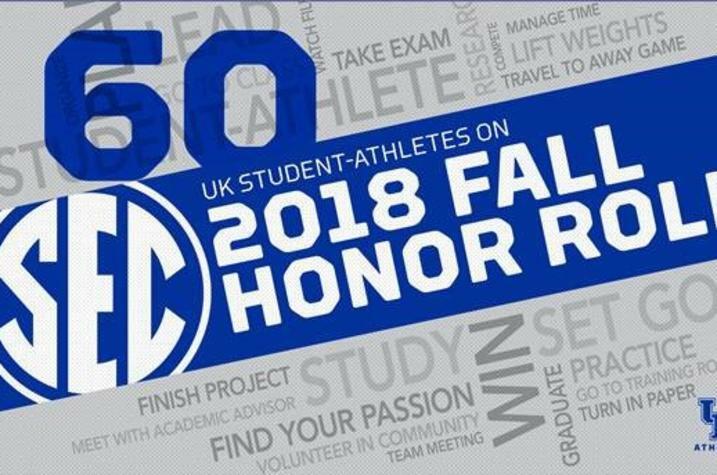 LEXINGTON, Ky. (Feb. 11, 2019) – Sixty University of Kentucky student-athletes were named to the 2018 Fall Sports Southeastern Conference Academic Honor Roll, announced Feb. 7 by SEC Commissioner Greg Sankey. The 2018 Fall SEC Academic Honor Roll includes the sports of cross country, football, soccer and volleyball. It is based on grades from the 2018 spring, summer and fall terms. UK had four representatives from men’s cross country, three from women’s cross country, 23 from football, nine from men’s soccer, 11 from women’s soccer and 10 from volleyball. Among other qualifications, a student-athlete must have a 3.0 grade-point average for the preceding academic year or a cumulative 3.0 GPA. In addition to the academic success, Kentucky teams also had success on the fields of competition in the fall, highlighted by conference championships in men’s soccer and volleyball, along with a 10-win season and VRBO Citrus Bowl championship by the football team.